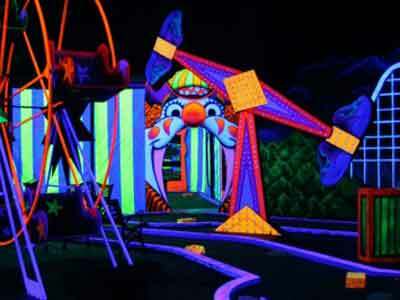 Rocky's Fun House is a Wheel Chair friendly, Indoor, Four-Themed, 18 Hole, Glow-in-the-Dark, Privately Designed, Miniature Gold Course unlike any you have ever seen! 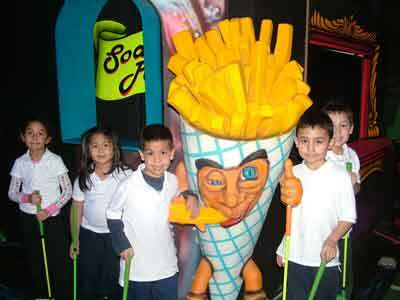 When entering Rocky's Fun House you will be immersed in a world of bright colors and incredible fun. 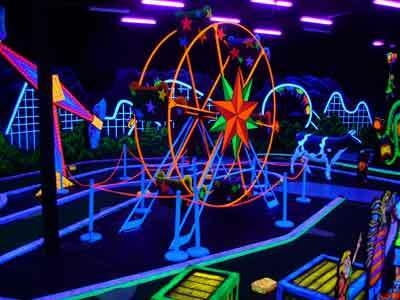 Start the course in our amazing Theme section, with Rocky's Coaster, and a 16-foot moving Ferris Wheel. Next enter the Big Top! Inside your senses will be overwhelmed in our amazing Wacky Mirror Room to entertain you along the way. Continue, and prepare for fun in our Carnival Concession Area, with our computer-generated animation that will make you feel like you are a part of the action. Then exit into the heart of our circus, complete with Trapeze Artists, Elephants, escaped Monkeys-Gone-Wild, and a human cannonball. From there, you will make your way through the Carnival Midway-Extravaganza and to the Strong Man Bell Ringer as you approach the Grand Finale. Get a Hole-in-One and win another 18 Hole round for you or yours.